In the modern Japan, marriage is quite free for the young people. They are free to date with anyone (some parents complain but that happens in everywhere) and choose the person to get married. Still arranged marriage is an option, especially in the countryside. There are usually nosy elder people who love match making. That is called Omiai (お見合い) and it still works out for some people. But how samurai managed their romance and marriage in Edo period? 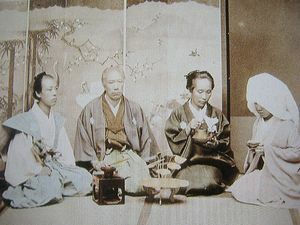 The marriage in Edo period was always addressed by the third party. The opinion of parents or the seniors was much more important than the preference of the person. Omiai was for common people but it wasn´t usual for samurai class because they thought, “It´s a shameful thing for samurai to evaluate young girls”. 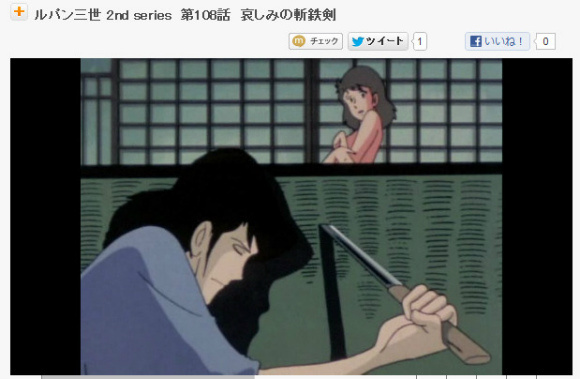 According to Goemon from the anime, Lupin III, a samurai should´t be utterly infatuated with women. To the higher class Samurai such as Daimyo (大名), Shogun (将軍) or someone higher than Daimyo would come with the suggestion. Of course no one would dear to reject Shogun´s offer. The same thing happened to higher class samurai of the clans. If the both family is in the same class and have children with marriageable age, the parents decided between them. This is already in Meiji period (明治時代 1868-1912), but we can get an image. Etsuko was the sixth child of Inada family who was a higher class samurai of Nakaoka clan (長岡藩, now Niigata prefecture). She was born in the 5th year of Meiji (1873) and when she was 13, her mother told her. "Etsuko, with the divine protection, your husband to be has been chosen. You must thank to your brothers and others for their great help." The marriage wasn´t for individuals at all back in time but for families. The main reason was not to continue the family. Like Etsuko, without knowing, the family decide the husband or the wife to be and when to get married. Needless to say, even though people had a shorter life and got married much earlier than now, a 13-year-old girl was aware of their future, especially to have a family. What we see from our point of view in the 21st century, this sounds like a sacrifice but if we put ourself in their shoes (don´t think they had shoes though…), the people in the old time had a perspective toward marriage that was to share the happiness rather than thinking about “my own” happiness. And for the same reason, there are still many countries where keep arrange marriage, I guess. 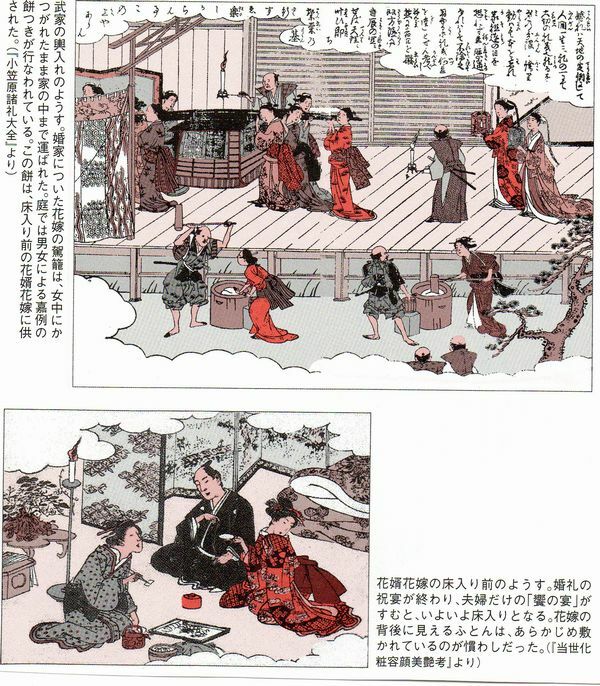 The story of Etsuko, you can read it here, “武士の娘 (A daughter of samurai)”. I´m curious to read it. Lower class samurai had some limitations in terms of choosing a marriage partner. Lower samurai means Hatamoto (旗本/ retainer of shogun) or Gokenin (御家人/ lower-ranking vassal). For example, they could not marry to the follower of other daimyo. Even though both families were the same vassal of the shogun, the same post could not be married. Also the marriage with other social class family was not allowed. This was mainly to avoid the lower vassals to form a party against the Shogun. This is a document applied by a vassal asking for a permission to marry in 1861-63. Once they get the permission, then they could have a wedding ceremony. 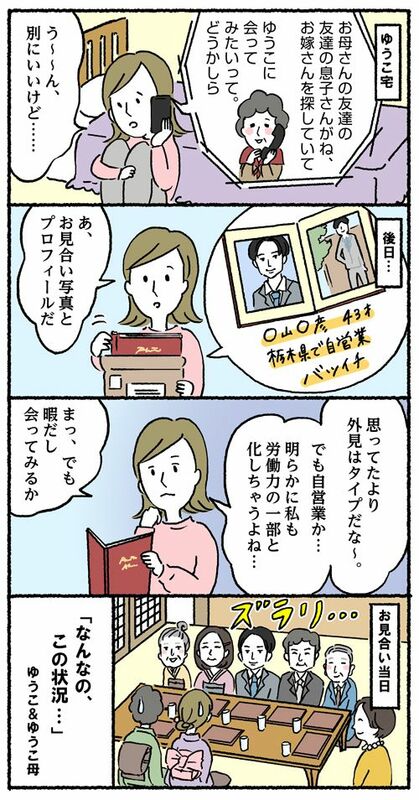 And they had to present a marriage registration. 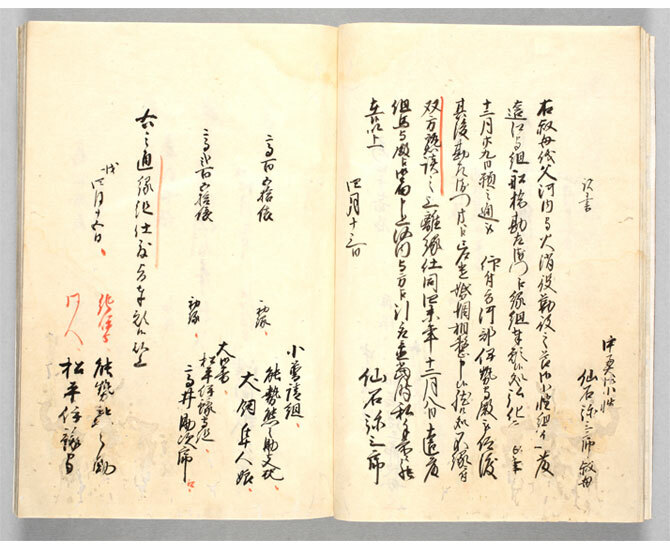 Bureaucracy already existed in Edo period. These are the wedding ceremony held those days. The wedding was called Koshi-ire (輿入れ). The bride was carried in the basket called Kago (駕籠) to the groom´s family house and it was brought into the house by maids. In the garden, mochi was prepared for the celebrations. This mochi was offered to the new bride and groom before they got into the bridal bed (or futon in this case). The picture below is just before Tokoiri (床入り), the first night the new couple goes to bed together. After the wedding party, there would be a small banquet just two of them. Then they were expected to go to futon together. The futon was ready for the couple during the ceremony. Sounds kind of awkward that the family is expecting you two to sleep together but it´s understandable if the life was short and it was important to continue posterity for the family. 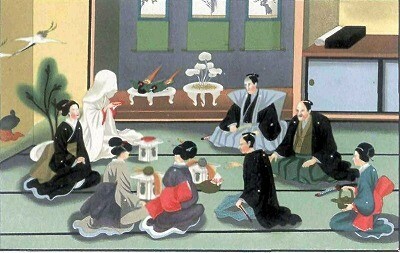 The wedding style Japanese people have now is more or less the same as Edo period. I just hope they were happier than it shows in the photo even though their marriage was arranged for the families. “A Daughter of the Samurai” by Etsu Inagaki Sugimoto is a charming book. 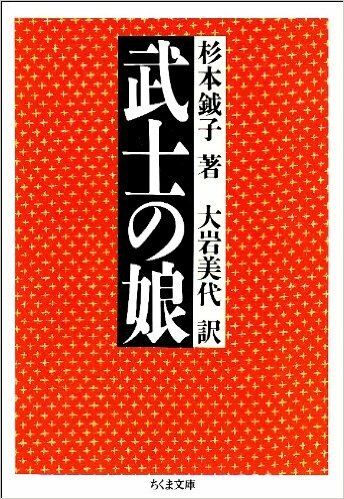 It has been translated into English but has been out-of-print for a while. Used copies are available at Amazon or elsewhere. Thank you for the information. I´m very curious to read this book. Have you already read it?